On 29 May 1953, Sir Edmund Hillary and Tenzing Norgay reached the summit of Mount Everest, the world’s highest mountain. Travelling as part of a British expedition, they were the first climbers to ever reach the 8,848m summit. 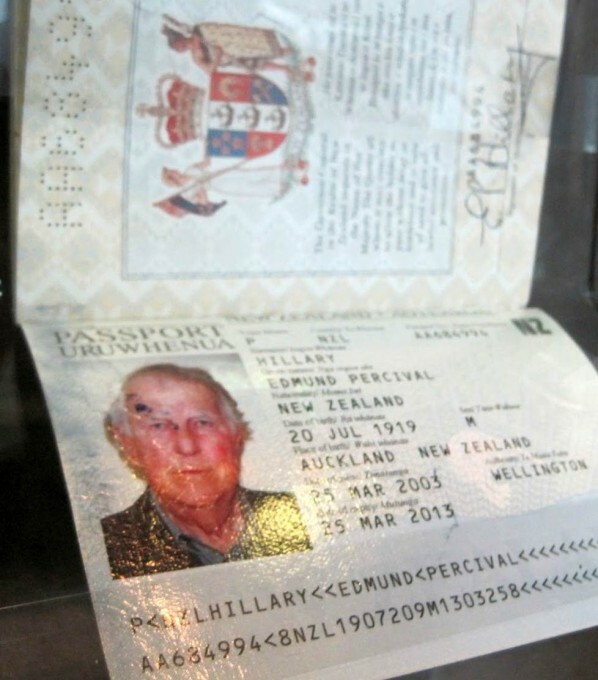 The Otago Museum in Dunedin, New Zealand is showing his passport from 1953 and the passport of late Sir Edmund Hillary. I couldn’t find any passport pictures from Tenzing Norgay (Indian Prime Minister Jawaharlal Nehru gave him an Indian passport) but read more about him HERE – the man who spends by 1953 more time on Everest than any mortal. Sir Edmund Percival Hillary KG ONZ KBE OSN (20 July 1919 – 11 January 2008) was a New Zealand mountaineer, explorer, and philanthropist. On 29 May 1953, Hillary and Nepalese Sherpa mountaineer Tenzing Norgay became the first climbers confirmed to have reached the summit of Mount Everest. They were part of the ninth British expedition to Everest, led by John Hunt. On 22 April 2007, while on a trip to Kathmandu, Hillary suffered a fall, and was hospitalised after returning to New Zealand. On 11 January 2008 he died of heart failure at Auckland City Hospital. Flags were lowered to half-mast on New Zealand public buildings and at Scott Base in Antarctica, and Prime Minister Helen Clark called Hillary’s death a “profound loss to New Zealand”. On 21 January, Hillary’s casket was taken into Holy Trinity Cathedral, Auckland, to lie in state. A state funeral was held on 22 January 2008, after which his body was cremated. On 29 February 2008 most of his ashes were scattered in Auckland‘s Hauraki Gulf per his desire. The remainder went to a Nepalese monastery near Everest; a plan to scatter them on the summit was cancelled in 2010.